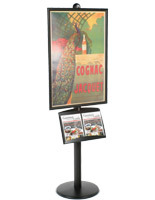 This Big Poster Stand combines your 24" x 36" sign with a leaflet holder! 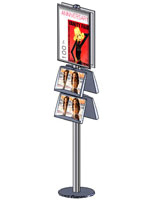 This big poster stand brings advertising messages together with takeaway literature! 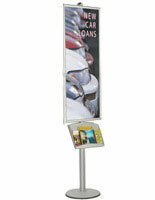 An aesthetically pleasing, big and versatile 8 ft ad stand! 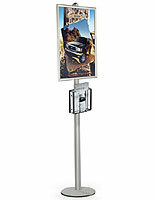 This big poster stand, also known as sign holder, has a large 24"w x 36"h poster holder and a durable metal leaflet tray. A Snap open graphic holder makes sign changing effortless. 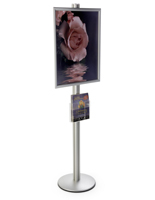 The sign display and brochure tray are height adjustable along the entire big display stand pole. 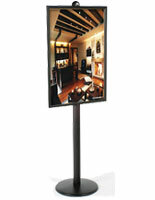 This big poster display works best in large, indoor, high traffic areas. 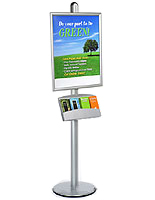 This big display is most popular for large retail areas, hotel lobbies, shopping malls and walkway applications with pedestrian activity. 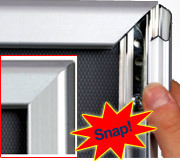 Snap open frames make it easy to swap graphic media. Simply pop open all four edges, insert the graphic media beneath the lens and snap the edges closed. A clear, non-glare PVC plastic lens is provided to protect your sign media. The metal open style tray is powder coated steel for durability and long life. 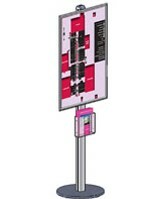 Poster Holder and Literature Tray installation and height adjustment is easily performed using the screws on the connector plates on the back of the poster frame and document holder. 25.5" x 94.0" x 17.5"